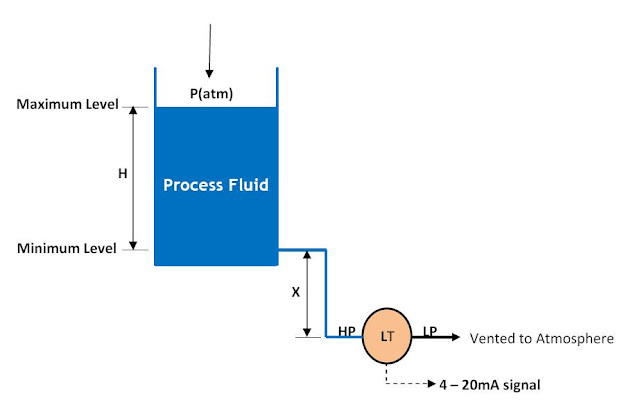 From the diagram above, it can be seen that when the tank level is minimum (H = 0), the liquid in the high pressure impulse line exerts a constant pressure (P = X*S.G) on the high pressure side. With this, the transmitter output is now proportional to both S.G*H and S.G* X. To make the transmitter output proportional to only S.G*H, we suppress the S.G*X part of the transmitter output by negatively biasing the transmitter by –S.G*X. This implies that the range of level measurement will be between S.G*X to (S.G*H + S.G*X.) 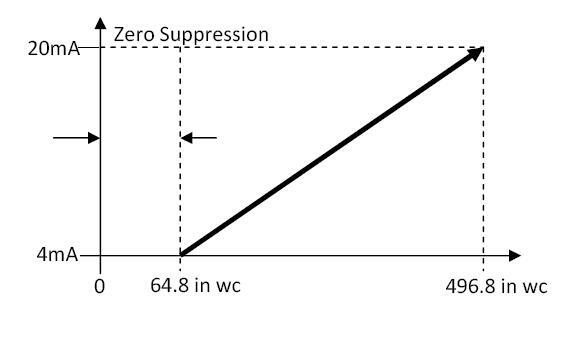 This procedure is called Zero Suppression and is done when calibrating the level or DP transmitter. Differential pressure = S.G*X = 0.9*72 = 64.8 in wc. <! [endif]-->At 0% minimum tank level (H = 0) 4mA = 64.8in wc and at 100% maximum tank level (H = 40ft) 20mA = 496.8 in wc. Note that the same calibration method above is used if the installation is a dry leg.